WARSAW — The Warsaw Breakfast Optimist Club recently $500 to The Baker Youth Club. Through various fundraising activities during the year, the Warsaw Breakfast Optimist Club raises nearly $30,000 to donate to youth oriented activities. The Optimists invite anyone to join them at 7 a.m. Wednesdays for their breakfast meeting in the Shrine Building at the Kosciusko County Fairgrounds. 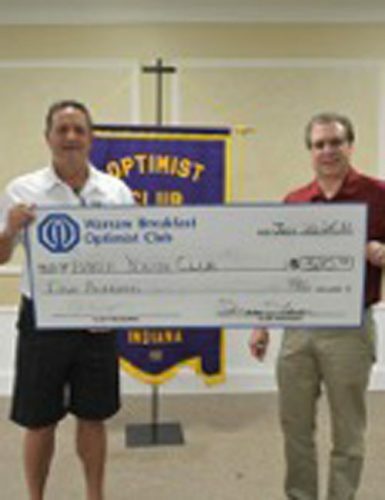 The Warsaw Breakfast Optimist Club is the number-one Optimist Club in the state of Indiana and number six in the world. It is also the proud recipient of the 2013 Heart of Gold Award presented by the Kosciusko County Community Foundation. For more information about the Warsaw Breakfast Optimist Club, visit warsawoptimist.org.